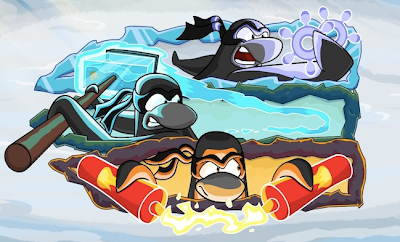 Club Penguin Cheats by Mimo777 Club Penguin Cheats by Mimo777: Card-Jitsu Snow Beta Test Update! What i would do is wait for a while until it looks like all players have a power card.Then i would wait from them to place it then i would put my power card with someone elses and try to get a combo because i like the power it gives you when you make a combo. Awesome battle plan, batmanfan9! Combos rock. Cp added 10,000 coins to your account for having your comment featured this week! We're already into our third week of the Card-Jitsu Snow Beta Test! Can you believe it? It's been awesome! And the team's been really busy taking your feedback and fixing bugs to make the game better. A couple weeks ago they showed us some of the bugs they've been working on. Well, here's an update. There is still lots more to be done with CJS. So keep playing and keep the feedback comin! My tip for the club penguin snow game is that use your power card on the opponent that makes the most damage. And if the snow player puts down a power card and you have little life left try to move into the red square because when the snow player uses the card it can boost up the life of your penguin.